KEEP IN MIND THIS IS JUST MY BEST GUESS NOT WHAT BLIZZARD SAID THEMSELVES. ALSO EVERYTHING IS SUBJECT TO CHANGE. 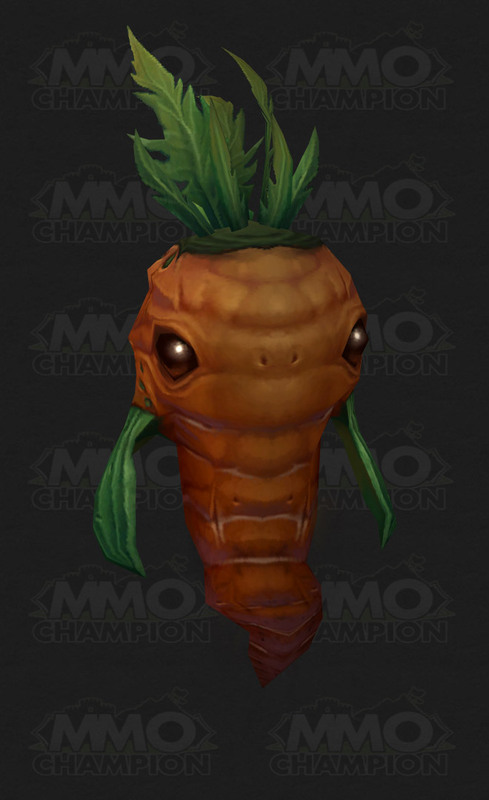 My name is Carrotus Maximus, commander of the Gardens of the North, General of the Vegetable Legions and loyal servant to the TRUE farmer, Oldus MacDonaldius. Father to a picked son, husband to a harvested wife. And I will have my vengeance, in this life or the next. Now if it only sports a spiked face helm and a gladiators sword! It should be riding a tractor on a crop harvester shooting freaking lazer beams! Three snail team beat him. It took forever to kill him, so this is probably not the best strategy. Everything else he cleansed or healed through. Terrible Turnip + Sinister Squashling + Crazy Carrot - get full team of dreadful vegetables! Presently, the pet book lists the Crazy Carrot's price as being 50 seeds. I'm assuming this is a carryover from the beta, and is due to be changed. However, know that it is incorrect: the 1000 seeds *is* correct. EDIT: As of 6.2 this has now been corrected as far as I can tell. Can anyone confirm if this can be put in cage and sold to others? Anyone else think of this vid whenever they see the Crazy Carrot?